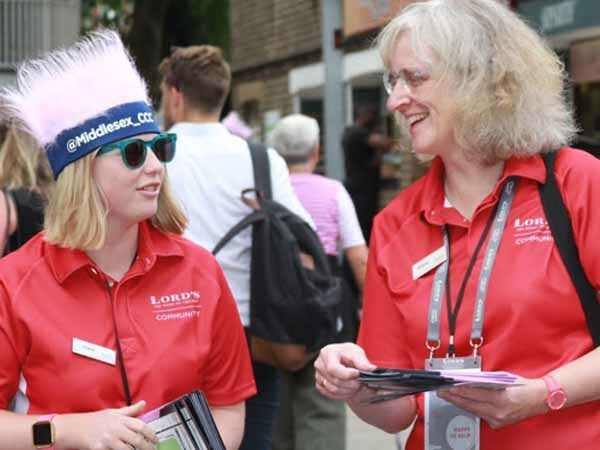 Lord's Volunteers are an essential component of the match day experience at Lord’s. Volunteers provide vital support, assistance and are on hand to answer any queries that visitors may have. Just look out for a bright red shirt! MCC is seeking to recruit General Match Day Volunteers or, for those with relevant interest and experience, Match Day Photography Volunteers. This is a varied role with a primary focus to support visitors to Lord’s, as well as helping MCC members of staff. Duties include responding to visitor queries such as giving directions and match information; supporting ‘come and try it’ activities, as well as helping community activities. The focus of this role is documenting community based work, for example, performers and volunteers in action. Whatever your role, you will be required to be approachable, committed, flexible and team-focused! Volunteer applications for the 2019 season have now closed. Fill in the details below to pre-register your interest for the 2020 season. All Volunteers will receive an induction, as well as general and specific training to support their participation in the volunteering programme.